The Latino community is diverse and that diversity is reflected in different levels of electoral participation. While voter participation for Latinos overall declined between 2008 and 2012, that wasn’t true for all sub-groups of Latinos. Latinos who have a college degree and those who trace their family origins to Cuba had the highest voter turnout rates among Latino demographic sub-groups in 2012. Seven-in-ten (70.8%) Latinos with a college degree and 67.2% of Latinos of Cuban origin turned out to vote last year—both substantially higher than the 48% turnout rate among all Latinos. By contrast, some of the lowest voter turnout rates among Latino demographic subgroups were among those with less than a high school diploma (35.3%), young Latinos ages 18 to 29 (36.9%) and those who graduated from high school (39.4%). Voter turnout rates for just about all major sub-groups of Latinos were lower in 2012 than in 2008 with a few notable exceptions. For naturalized Latinos who arrived to the U.S. between 1990 and 1999, their voter turnout rate in 2012 increased 6 percentage points over 2008. For Latinos ages 65 and older, their voter turnout rate in 2012 was up 4 percentage points over 2008. For Latinos of Puerto Rican origin, their voter turnout rate in 2012 was up 3.1 percentage points over 2008. Among Latinos by country of origin group, Cubans were followed by Hispanics of Central or South American origin (57.1%), other Spanish origin (53.7%) and Puerto Rican origin (52.8%). Hispanics of Mexican origin had the lowest turnout rate—42.2%. Hispanic females voted at a higher rate than Hispanic males—49.8% versus 46.0%. And Hispanics who are naturalized citizens voted at a higher rate than Hispanics who are U.S.-born citizens—53.6% versus 46.1%. Finally among Hispanic immigrants, 58.8% of those who arrived before 1990 voted, while voter turnout rates were lower among those who arrived between 1990 and 1999 and those who arrived after 2000—47.2% and 44.1% respectively. Hispanic non-voters in 2012 differed in many ways compared with Hispanics who voted. Overall, Hispanic nonvoters were more likely to be male, young (ages 18 to 29), never married, have a high school education or less, to be of Mexican origin, have annual family incomes of less than $50,000 a year and not be in the labor force compared with Hispanic voters. However, two large differences are evident between Latino nonvoters and Latino voters. The first is the relative youth of Latino nonvoters. Among them, 40% were under the age of 30. By contrast, among all Latino voters, only 25% were ages 18 to 29. The second is the Hispanic origin of nonvoters. Among Hispanic nonvoters, two-thirds (66%) were of Mexican origin in 2012. 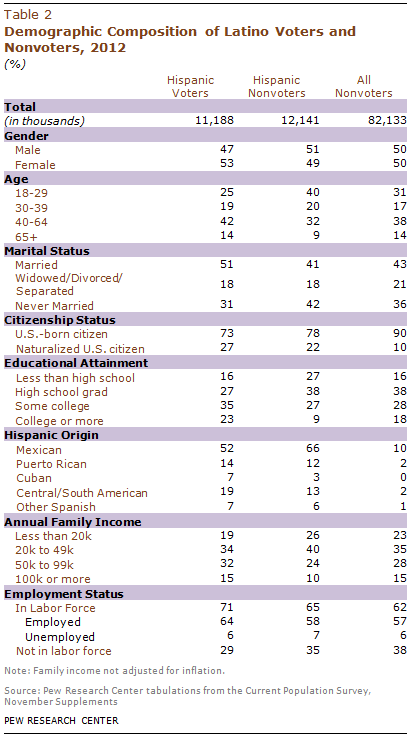 Among Hispanic voters, half (52%) were of Mexican origin. Hispanic nonvoters were also less likely than Hispanic voters to be Cuban (3% versus 7%), Central or South American (13% versus 19%) or Puerto Rican (12% versus 14%). In 2012, Hispanic nonvoters also differed from other nonvoters. While 40% of Hispanic nonvoters were between ages 18 to 29, 31% of all nonvoters were in the same age group. And while 27% of Hispanic nonvoters did not have a high school diploma, just 16% of all nonvoters did not have a high school diploma. Overall, some 82 million U.S. eligible voters did not vote in 2012.